. 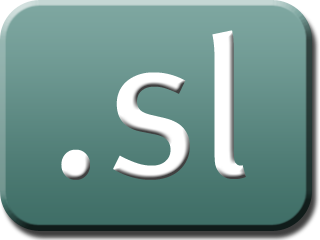 sl is the country code top -level domain ( ccTLD) of the Republic of Sierra Leone. It was introduced on May 9, 1997, is managed by the telecommunications company Sierra Tel or the National Telecommunication Committee. Domains can be registered since the year 2008, when the organization AFCOM has officially commenced operations with its headquarters in Freetown. Overall a must. Sl- domain be between four and 63 point and contain only alphanumeric characters. A resident or established in Sierra Leone are not required to register a. Sl- domain.